Sera years ago, sometime in the 1990s, Dr. Mohini Giri, Founder President of the Guild of Service came into contact with Shri Uday Singh Samodia, a small scale business man from Sawai Madhopur, Rajasthan, who sought to know more about the work of the Guild. He turned out to be a sensitive philanthropist. The Guild’s major initiative at that time was Amar Bari, a shelter home for widows functioning in Vrindavan, UP, in a rented haveli, largely tending to Bengali widows abandoned by their families. In a state of ‘’living death’’, a phrase used by historian Uma Chakravarti, such women sang bhajans all day at the mandirs/temples to earn a fistful of rice and a cupful of dal as their daily ‘payment’. They subsisted in the streets, and were often abused physically and deeply scarred mentally. To rescue widows from such destitution, Dr. Giri had created a home where they would find safety, nutritious food, occupation, and companionship. Most of all, they were to retrieve their dignity as women and realise their personhood. The gentleman from Sawai Madhopur was most touched by this story of rehabilitation, and gifted a piece of land (648 sq, yds) and a small building on it to the Guild through a Will. The property was registered in the name of the Guild For Service on 3 September 2002 and the unit in Sawai Madhopur was established. Family Counselling Centre, supported by Central Social Welfare Board, Govt of India. Geriatric Care course, in collaboration with National Institute of Social Defence, Ministry of Social Justice and Empowerment, Govt of India. Production Centre for Tailoring and Embroidery, supported by bulk orders. Professional course in 'Beauty and Wellness', in association with entrepreneurial chain Kaya Kalp, supported by WRG, USA. 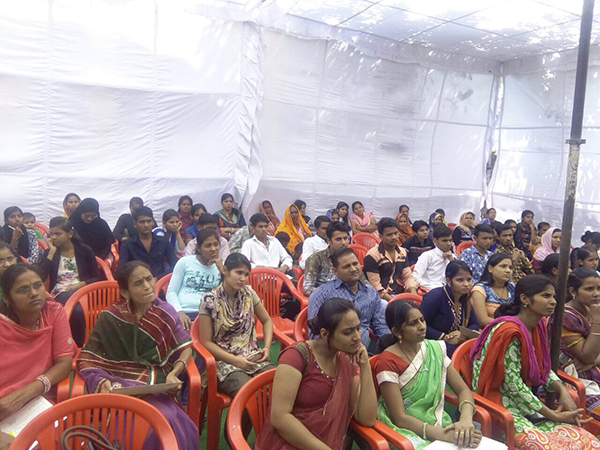 Family Counselling Centre has been the Guild’s longest engagement in Sawai Madhopur. 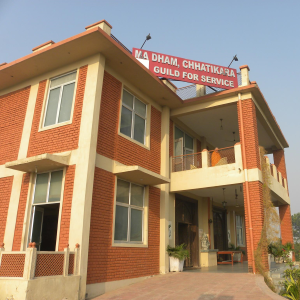 Started in October 2008 with Shri Devender Kumar as its first Counsellor, the Guild moved into the field to help the community and its people in trying to resolve everyday issues. Family Counselling Centres, supported by the Central Social Welfare Board, function as "referral and rehabilitative services to women victims who are in moral danger within the family or society at large including those affected by disputes, marital discord or maladjustment is provided free of charge" (FCC website). The FCC of the Guild appointed two well-qualified Counsellors, Dilip and Vidya Yadav in April 2010, who continue to fulfil the goal of proactively resolving the problems that frequently occur: dowry demands, domestic violence, marital discord, mental incompatibility, intergenerational issues, mismatched value systems etc. In the current year from April 2016 to March 2017 the FCC received 116 cases, of which 110 are solved and 6 are pending. Every month the Guild at Sawai Madhopur organizes meetings of its Executive Committee. Mohalla Meetings, held monthly, aim to create awareness of women's rights, understanding of "The Protection of Women from Domestic Violence Act, 2005" , details of services available through the FCC etc. This year the outreach meetings were organised in Gulab Bagh, Gram Thingla, Subhash Colony, Aalanpur among others. Other staff appointed at the Guild were Mukesh, peon, upon whose sudden death, his widow, Hemlata, was given the same job on compassionate grounds in 2015. With the objective of training underprivileged women, the Guild organised a three month certificate course in Geriatric Care from September to Dec 2016, with support from the Ministry of Social Justice and Empowerment. Two Nurse-Teachers, Mr. Ghanshyam and Ms. Rubina, were recruited and functioned under the guidance of a senior practitioner, Dr. Sohan Lal Meena. Guest lectures, including by a specialist Dr. Varun Kaul, from SMS Trauma Centre, Jaipur, expanded the horizon. Practical internship was assured at Ranthambhore Sevika Hospital, a multispecialty hospital in Sawai Madhopur. The Geriatric Care course comprised of the following units: Ageing and concepts of Gerontology and Basic Geriatrics; Fundamental Health Care of the Aged; Rehabilitation; Hospital/Field Visit. 23 successful students received their certificates, jointly issued by the Ministry of Social Justice and the Guild of Service, on 3 March 2016. Dr. Sudhir Varma , IAS retd, was the Chief Guest. The success of the first course brought in the grant for a second Geriatric Care course which was conducted from 5 March- 12 June 2017. Recognising the local demand for such skill training, it was decided to enroll boys as well as girls. This time, additional faculty, Mr. Lokendra Gautam joined for some weeks. The same curriculum and internship plan was followed. The Sawai Madhopur unit had by then established contact with the Institute of Health Management and Research, Jaipur, and the standard of learning was appreciated by Dr. Ashok Agarwal and Dr. HD Gupta. On the basis of a final text, 24 students were declared successful and will be given the joint certificate by the Ministry of Social Justice and the Guild of Service . Placement contact was also given to the students. Students paid no fees for these courses as per GoI terms. The Guild’s course in Sawai Madhopur in cutting, tailoring and embroidery started in March 2004, initially under NORAD’s scheme. It was visited and appreciated by Shri Namo Narain Meena, then Minister of State for Finance in Government of India. The Guild’s effort received local guidance from the prominent social worker, Smt Yasmin Abrar. In May 2010, Ms. Mamta Jain was appointed as Trainer for tailoring and mehndi, and Asha Paliwal was appointed as Clerk. Mamta has been giving free instruction to women from deprived backgrounds with poor education. The Guild’s head office has provided several sewing machines, basic tools, and raw material. To date about 80 students have showed competence in earning occasionally through piece work, and making garments for themselves and their families. There is no formal examination or certificate but a good portfolio of samples has been created that can be shown to potential sponsors who can place bulk orders for items such as school uniforms, blouses, pants, salwar kameez sets or household items. Lately, in summer 2017, a bulk order for 100 school uniforms for young children has been completed successfully. Students paid a one- time facilitation charge of Rs. 100 per head. The Guild in association with Kaya Kalp, a well-established chain of beauty parlours in Rajasthan, has a started a professional course in 'Beauty and Wellness' at Sawai Madhopur on 9 August 2017. A fully equipped training lab has been set up. The certificate course of 3 months prepares students in managing a parlour and offering professional quality services. Wanting to promote a holistic view of "beauty", instructions on body care, hair and skin are accompanied by sessions on Yoga and nutrition. The course is targeted to train young women from disadvantaged backgrounds who will not only improve their own capabilities but may become wage earners or small entrepreneurs. The syllabus focuses on beauty care processes that are natural, herbal, inexpensive and accessible to people of ordinary means. Kaya Kalpa’s trainer Ms. Shaheen is taking classes 4 days a week, and Ms Vidya Yadav, Counsellor, has been put in charge of coordinating the course on a day to day basis. She has a certificate in Beauty Care and can take some classes and practice sessions also. Students pay fees of Rs. 3000/- plus Rs. 500 registration for the entire 3 months. Tis is far below standard fees for such a professional course with hands-on practice. In the first batch 9 students have enrolled. At present Ms Meera Khanna, Executive Vice President of the Guild, along with Dr. Malashri Lal Regional Convener for Rajasthan, are overseeing the courses and general administration. Occasional help has been received from Ms Padmini Rathore, Advocate in Sawai Madhopur, women’s activist lawyer and highly awarded social worker. Ms. Diana Khambatta, Executive Committee of the Guild was actively guiding the work from the headquarters. Ms Yasmeen Abrar, former member of the National Commission for Women, and a political leader in Sawai Madhopur was also advising the Guild on local matters. "Your article is informative and a succinct presentation of the social intervention being made by the Guild". Dr. Sukrita Paul Kumar. New Delhi. Academic, poet, social activist for humanities studies. "This is wonderful. It catches up the true spirit of the work being done by the Guild." Dr. Ashok Agarwal, Founder, Indian Institute of Health Management Research, Jaipur. "I'm so delighted to know that Geriatric Care courses are being opened to the women in Rajasthan."Ms. Sumedha Sen. ‎Healthcare Consultant, Gurgaon. The Family Counseling Centre at Sawai Madhopur has been working past many years and providing counseling, emotional support, psychological support and legal education to the inmates in the area. It has served as the catalyst in the region and encouraged people in the rural area to discuss their issues with the counselors and seek help. The family counseling centre at Sawai Madhopur in the current year received 105 case including domestic violence, alcoholism, mental harassment, over indulgence of the in-laws form both sides of the couples, irresponsible husbands, misunderstandings, extra marital affair etc. out of which 98 cases have been successfully closed. The family counseling centre resolves the cases of drug abuser or excessive alcoholism with the help of the homeopathy as provided by Dr. Suresh Sharma. Every month FCC at Sawai Madhopur, organizes the Executive Committee Meeting and Mohalla Meetings. These meetings are aimed to creating awareness among women about their rights, imparting knowledge about the Domestic Violence Act 2005 along with the familiarity of various activities taken up by the Family Counseling Centre in detail. 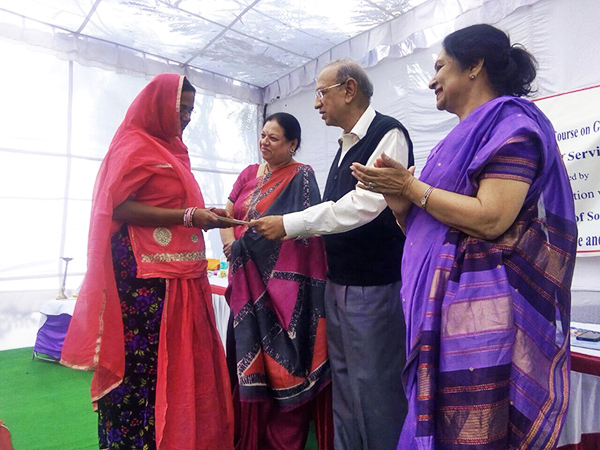 The Sawai Madhopur branch of the Guild of service also organized the Vocational Training Program throughout the year, where many marginalized girls and women learned basic living skills. The girls are imparted with vocational training in Mehandi Application, Cutting and Tailoring etc. at free of cost. Under the guidance and supervision of Ms. Mamta Jain (Instructor). They have been proving themselves to be an asset of the society not the burden, by learning these skills they also help their families.